It was a dark and rainy night. The Turtles, wearing their trench coats and fedoras, investigate a reign of mob terror. Donatello, in his worst Sam Spade impersonation, narrates this pulp/film noir story about banks all over the city being “taken down by the mob.” Don tells the viewer that the mob is using sophisticated weaponry – the kind that could be only supplied by Shredder. Don-san muses which mobster would be “gutsy” enough to deal with Shredder. The answer? Tony “The Butcher” Vivaldi. April tells the boys that the police identified him from one of the bank hold-ups. She also tells them that he hangs out at a club called The Meat Rack. Before the Turtles head off toward the club and April heads back to Channel Six News to file her story, she sees a statuette of a hamster in an antique shop window. Ms. O’Neil just has to have it. Inside the shop, April purchases the statue for a mere ten dollars and has it delivered to her apartment. Michaelangelo tries to purchase what he believes is an antique pizza-maker, but he’s twenty cents short of the asking price. As April and the Turtles leave, a long black limousine pulls up to the shop. Out steps Tony Vivaldi. Inside the shop, he holds a gun on the old proprietor and demands the statue of the hamster. When the old man informs him that he just sold the statue, Tony and his boys “waste” the place. A few blocks away, April and the Turtles agree to meet each other later. Michaelangelo finds a quarter on the street – now he has enough to buy his pizza maker! Mike rushes back to the antique shop only to find himself staring down at the business end of Tony’s gun. One of Tony’s boys recognizes the lone Turtle, suggests that they were supposed to “nab” the Turtles, and using an electronic gizmo, the gangster captures Michaelangelo. Back on the street, the other Turtles begin to worry about their missing compadre and return to the antique shop to find it destroyed and learn that Michaelangelo has been kidnapped by “The Butcher.” The TMNT decide to split up and search for Mikey. Raphael is also nabbed by The Butcher. Leonardo and Donatello decide to get Splinter’s help before they get nabbed as well. Suspecting that there is some connection between the antique shop and The Butcher, Splinter joins Leonardo and Donatello as they head back to the antique shop district. There they encounter The Butcher destroying yet another antique store. Unfortunately, the mobster spots our heroes. Using the same gizmo that he used on Raphael and Michaelangelo, The Butcher is able to capture both Splinter and Leonardo. Donatello, in his attempt to escape to get help, is trapped under a falling building, thanks to a laser blast from The Butcher’s gun. A short while later, Donatello pulls himself out from under the rubble and painfully heads over to the Channel Six News Building in search of April. Meanwhile, The Butcher is being yelled at by Shredder because he has yet to recover the Maltese Hamster, in spite of all the gadgetry that he’s been supplied with. The Butcher begins to make excuses as to why his “boys” can’t hit every antique store in town, when Shredder cuts him off by explaining that one of the devices, that he so generously gave him, is a super-conducting magnet – if he just sets it to “antiques” it will electro magnetically empty out every antique shop in a fifty mile radius and pull the antiques right to his headquarters. The Butcher is impressed (although why Shredder didn’t just use the device on his own is anyone’s guess). The gangster adjusts the machine and sure enough, antiques from dozens of stores are electro magnetically removed and begin floating down the street, where one hits Donatello in the head. He and April decide that following the floating antiques will lead them to The Butcher. In a back room of the Meat Rack, April and Donatello overhear The Butcher explain to Shredder that they can’t find the Maltese Hamster. As they try to sneak away to find Splinter and the other Turtles, Donatello knocks over a crate, alerting everyone of their presence. The heroes make a break for the dance floor, foil the villains, escape out onto the street and head back to April’s apartment. Donatello is convinced that the thing that Shredder wants is April’s statue, which coincidentally is delivered shortly after they arrive. Donatello instructs April to meet him at the docks at midnight with the statue as he leaves to find out why the statue is so important to Shredder. Don hoodwinks Tony and boys into revealing that some scientist on the Isle of Malta had developed a “super fuel.” Unfortunately one of the scientist’s latter experiments fatally wounded him, but before he died he left the super fuel formula in the statue of the hamster. Shredder believes that this super fuel will restore the Technodrome and then he will be able to rule the world. In an exchange for his “assistance,” Tony gets Detroit. When The Butcher learns that he has been tricked, he and his boys fire upon Donatello, who escapes unharmed with one of Shredder’s laser guns. 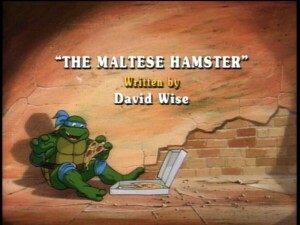 At Midnight, Shredder arrives at the docks to learn that The Butcher does not have the Maltese Hamster. He starts going ballistic, when suddenly Donatello steps out of the shadows with a bundled package. He attempts to make an exchange – the Hamster for Splinter and the other Turtles. Shredder agrees, and then reneges once he has the Hamster and the formula in his hand. Donatello then signals April, who fires Shredder’s own laser weapon at the Hamster. It melts in his hand – the formula is gone. Shredder believes that The Butcher is responsible and teleports all the weapons that he had provided to the gangland boss before retreating back to the Technodrome.